I probably worked harder capturing this image than any other image I’ve ever photographed. Worked hard not in terms of physical exertion, but rather in patient pursuit over several years and painstaking execution in difficult conditions. Photographed late last month in Yosemite, this image is something I’ve visualized and actively sought for years. While I have no illusion that this image will be as popular as some of my more conventional images, it makes me so happy that I just have to share everything that went into its capture. 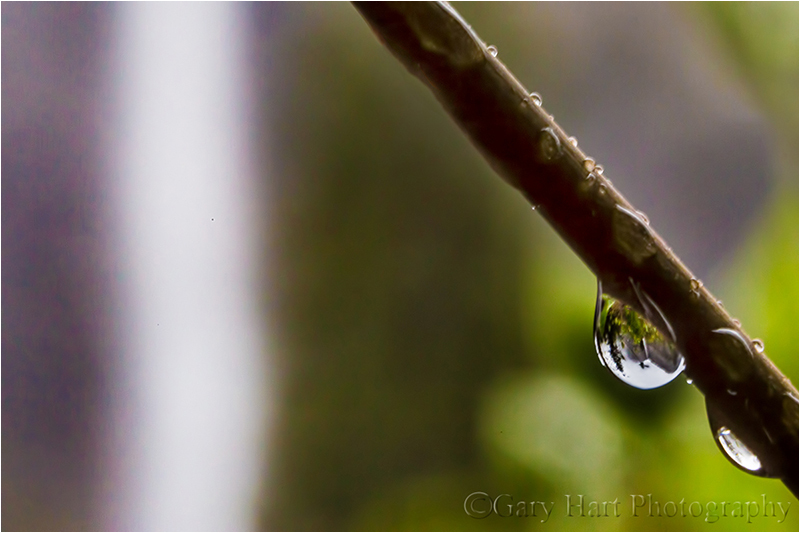 I can trace this image back to a spring afternoon a few years ago, when I was doing macro photography in a light rain. My subject was poppies, and peering through my viewfinder I particularly loved the clarity of the raindrops when they snapped into focus. At home on my monitor I magnified one of the images to something like 400% and saw the entire scene surrounding me was inverted in that tiny droplet. The fact of this wasn’t new to me, but actually seeing it up close planted a small seed that bloomed into an obsession I’ve been chasing ever since. I realized that getting even closer to a raindrop might allow me to enlarge its internal scene enough to make it visible without magnification. From that thought it was a short jump to the idea of finding a raindrop that contained a scene others would recognize. Unfortunately, the onset of my raindrop quest coincided with a drought that severely limited my access to raindrops (and if you know anything about me, you know it has to be an actual raindrop—no spray bottles for me). And then there are the daily distractions of running a business, and the fact that many of my trips to prime locations are for workshops, when the time and attention a shot like this requires precludes me from trying it. Nevertheless, over the last several years I’ve played with my idea when opportunities presented themselves. These experiences allowed me to determine that 100mm macro wouldn’t get me close enough, that I’d need to add multiple extension tubes. And the extremely narrow depth of field that comes with focusing this close would require a very small aperture to get enough of the frame sharp. These early attempts also enabled me to identify and practice overcoming a few physical challenges: low light, caused not only by the overcast skies, but also by the extension tubes (extension reduces the amount of light reaching the sensor); wind, almost always present in a rain; and a tissue-thin focus plane (even at a small aperture) that severely shrinks my margin for error. I knew going in that it would be difficult, but with each attempt I had to admit that this shot might be even harder than I’d decided it would be the last time I tried it. Of course that’s half the fun. A couple of weeks ago the (always reliable) weatherman called for an all-day rain in Yosemite. Perfect. Knowing the dogwood were blooming, I freed my schedule and made the 7+ hour roundtrip to Yosemite, leaving early in the morning and returning that night. The raindrop shot wasn’t my sole objective, but it was up there on my list. Unfortunately, while I ended up having a pretty good day, my “all-day” rain stopped about an hour into my visit and I was left to pursue other opportunities. Undeterred, when the (almost always reliable) weatherman promised more rain a couple of days later, back I went, this time meeting friends Don Smith and Mike Hall. Did I mention that I wanted rain? Well, rain it did. Hard. All day. Donning head-to-toe rain gear, I managed to stay dry, but my equipment wasn’t quite so lucky—without a third arm my umbrella wasn’t much use during the compose/meter/focus phase and the small towel I’d brought to dry things off was completely saturated by the end of our first stop (I should have known better). After that I pretty much contented myself with drying my my lens element just before shooting, trusting (hoping) that my reasonably water-resistant gear would survive—if I wanted to keep shooting, I had no other choice. As good as the shooting was, by mid-afternoon the three of us were ready to submit to the weather and head for home. But, with my raindrop shot gnawing at the back of my mind, on the way out I suggested a quick stop at the view of Bridalveil Fall on Northside Drive. I’d stopped here on Tuesday and knew the dogwood that hadn’t been quite ready for primetime then would be just about right now. So stop we did (it didn’t take lots of arm twisting). Okay, so maybe this won’t be such a quick stop. After taking stock of the physical difficulties, I attached all three of my extension tubes (72 mm total) to my 100 mm macro lens and scanned the flowers, branches, and leaves for a raindrop that was both large enough to hold the scene (without extreme distortion) and whose long axis (the wide side) was perpendicular to my line of view to Bridalveil Fall. No small feat. The frustration started immediately: When I did indeed find the “perfect” drop, I realized getting to it without touching the tree (thereby rearranging all its drops) would require powers far beyond my superhero grade. And so it happened that once I navigated “inside” the tree’s canopy to my raindrop, the raindrop was long gone and I had to start over. This particular raindrop was about eight inches above my head. Fortunately my new (and wonderfully tall) tripod was up to the task—I extended its legs until my lens was just an inch or two from the drop and began the painstaking process of composing and focusing. With my viewfinder higher than my eye could reach, this part would have been impossible without live-view; with live-view it was a pain but doable. I found my basic composition fairly quickly, but my ridiculously thin focus plane shifted every time the breeze or nearby raindrop-strike jostled “my” raindrop. Focusing not on the raindrop, but the scene within the raindrop, I waited for a brief lull in the breeze and nudged my focus ring until the equilibrium point around which the drop vibrates was sharp. Then I magnified the drop and waited for the next lull to confirm sharpness. After several attempts I was reasonably confident I was ready to proceed. Stopping down to f22 with three extension tubes forced me to bump my ISO to 1600 to reach the 1/30 second shutter speed I thought I could get away with. Even this would require timing my shutter for another lull in the breeze, but the alternatives—a larger aperture which would reduce my DOF, or higher ISO that would increase the noise—I wasn’t crazy about. You’d think after all this I’d be ready to shoot. You’d think. But by now (in case you forgot, it’s still raining) my front lens element was festooned with raindrops. And wiping the lens dry did little good because the slightly upward angle of view oriented my lens ideally for capturing more raindrops. So I extracted the collapsed umbrella I’d proactively jammed in a jacket pocket and carefully threaded it skyward, carefully negotiating the network of overhanging branches without disturbing my raindrop, until the umbrella was in a open space wide enough to unfurl. Open umbrella in my right hand, with my left hand I was able to dry with a small, dry lens cloth I’d also had the foresight stuff in a pocket. One of the downsides of the “perfect” raindrop is its large size, which gives it a rather inconvenient relationship with gravity. So. After all this preparation and just as I raised my remote release for my first click, my raindrop grew tired of waiting and plunged groundward. True story. Fortunately, an advantage of getting intimate with raindrops is the insight that they tend to reform in the same place. I took a deep breath—with my composition, focus, and exposure already set, I decided to wait (still contorted between branches beneath my umbrella) for the next drop to form. And sure enough, within a couple of minutes I was back in business. I clicked a dozen or so frames, checking the focus after each, refining the composition slightly, and occasionally varying my exposure settings until I was confident that I had enough frames to give me a pretty good chance of at least one successful image. I probably would have worked on it even longer, but my muscles really were starting to cramp and I figured Don and Mike were ready to move on anyway. Back at the car a cursory run through my images on my LCD was enough to give me hope that I’d achieved my goal, but it wasn’t until I got them home on my large monitor that I was ready to proclaim success. Most of the images had very slight but nevertheless fatal focus problems—slight motion blur or barely missed focus point—all I needed was one. And this is it. So what did I end up with? The white stripe on the left is Bridalveil Fall in full spring flow. The branch belongs to my young dogwood tree; behind it are dogwood leaves and new (still greenish) flowers. And inside the raindrop is Bridalveil Fall, Cathedral Rocks, and Leaning Tower. But wait, there’s more: I’d actually had been working on the image a little while before looking closely at the black shape above Bridalveil Fall and realizing that a raven had flashed into my scene at the instant I clicked (it’s in no other frame). Pretty cool. Gary- loved the narrative and the shot!! I think that this might have been exactly why I want the Camranger. That would have eliminated part of your adventure issues in respect to focusing on the high tripod. Thanks, Brian. I’m afraid a Camranger would have required another hand. And is it waterproof? I’ll wait for your full report before springing for one. 🙂 See you in Yosemite. Great photo, Gary. I can just visualize you doing battle with the dogwood tree. Wonderful story, great image, very inspiring. Quick question, how far away from the raindrop was your lens face? Thanks, Gail. Maybe an inch or so, but given the awkwardness of my position, I didn’t really check. So at 10:15 tonight I read this (gottta get to bed – work tomorrow, busy day…yack yack) i get cramps thinking about you getting cramped…Barbara and I both did a collected “WOW” when I turned my MacBook Air upside down and tugged the screen outwards to magnify the image even further and witnessed the fruits of your long labour, waiting, patience, expertise, artistry and good vibes….I missed the Raven but when I read your article to the endI went back – tug, upside down view…. and did a “Geez Louise – there’s the raven!” Gary this is just wonderful…congratulations and, above all else, Thank You! 🙂 Denny and Barbara! Thank you, sir. It may have been a pain, but I had a blast. Thanks, Cathy. This is where my juggling skills came in handy. 🙂 Aloha! Extremely inspiring, wish I had been there to film you secretly going thru all that. you are such a show off, but that is from someone who is green with envy to say the least, Your post make my day, keep it up. Thanks, Tracie. I get kidded (accused?) all the time about spray bottles and leaf arrangement. That’s probably because I specifically look for raindrops and leaf patterns—no need to create them because they’re not hard to find if you look for them (as you know). I’m curious in this uber-macro mode… does the DOF affect the focus of the reflected image WITHIN the raindrop? IE – the focal plane is the raindrop, but the image within the raindrop is not part of the focal plane it’s on. Or is it on…? Makes my head hurt, but at F22, it probably doesn’t matter for this shot, but when you have that razor thin focal plane at F8…, 5.6… TWO POINT EIGHT? !…, is the raindrop focus affected by that reflected DOF…? If I understand your question, yes, the there’s a noticeable difference in focus depending on where on/in the raindrop I focus. As I twist my focus ring, I can see the point of sharpness move from the surface of the drop to the scene within the drop. In fact, I can actually choose where inside the raindrop I want the focus point to be, and watch the rest of the internal scene go soft. That effect is more noticeable when my internal raindrop scene is closer, for example when it’s a dogwood flower just a foot or so behind the raindrop. When I stop way down, my range of sharpness is much greater than what I see in my viewfinder, but in this case, DOF preview was just one more layer of complication that I didn’t want to deal with.